The generation of signals is an important development in the troubleshooting and development of electronic design. The generator is used to provide known test conditions for the performance evaluation of electronic system design and for replacing signals that are missing in systems during repairing work. Most commonly they generate sine waves. There are many types of generators but they all have the following common characteristics. a) The frequency of the signal must be known and stable. b) The signal must be free of distortion. c) The amplitude must be controllable from small to relatively large values. Some examples of these generators are function generator, pulse and sweep generator, sine wave generator, pulse and square wave generator and audio frequency signal generator. A simple sine wave generator consists of an oscillator and an attenuator. The frequency stability and freedom from distortion depends on the design of the oscillator whereas the amplitude accuracy depends on the design of the attenuator. Function generator basically produces square waves, saw tooth and triangular waves besides sine wave. 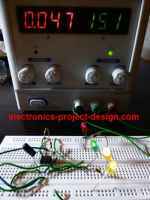 For a beginner to electronics design who design simple to medium complexity of circuitry, it is generally a good idea to have a basic function generator as a start. Audio generators produce signals in a range from a few Hertz up to several Kilohertz. Signals can be injected into audio amplifiers to see how they behave at various audio frequencies. Amplification and frequency response can be measured and distortion of the signal can be observed. Radio frequency generators can provide frequencies from about 100 Kilohertz up to several hundred Megahertz. With radio frequency generators it is usually possible to modulate the R.F. with an audio signal to simulate a radio station. Amplitude and frequency modulation are available. Using an R.F. generator the various tuned circuits in a radio can be adjusted for peak performance. A typical function generator specification from a Tektronix model is as listed below.